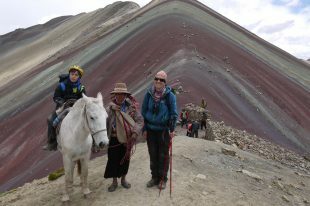 Maria walks the Moon Temple trek in this week’s blog, and takes on the highest mountain pass of her life, in Peru. Composed of two Quechua words, it perfectly captures this adventure trek, the Moon Temple trek to the Machu Picchu Inca site. ‘Quilla’ means moon, and this hike took us up to Quillarumiyoc, an archaeological site also known as Temple of the Moon. ‘Tambo’ is a shelter, made with perfectly aligned mud or stone, which the Incas built every 20 or 30km (one day’s walk) along their trails, as seen on this trail and the classic Inca Trail, too. On this stunning route to Machu Picchu, you can immerse yourself in the landscape far away from other tourists, and learn about a wonderful culture that is still very much alive, here in Peru’s high Andes. First stop was Chincheros, one of the few places near Cusco that visibly maintains its urban Inca design. We visited a URPI textile association that showed us how to dye yarns using natural fabric colourings from everyday Peruvian plants and household items. It was amazing to see how they made different red hues using lime or ash mixed with cochineal (Caccus Cacti), a parasitic insect grown on nopal leaves that is crushed to obtain a bright scarlet colour. Our hike started on an Inca Trail, we visited a Moon Temple where offerings to Pachamama are still made, all the while passing by terraces and Andean communities. We arrived at Zurite, a small town that formerly constituted the major agricultural centre of Tahuantinsuyo – the name given to the whole territory of the Inca Empire – and we spent the night in a local house full of colonial history, being one of the first houses to have been built in the region. Small rooms with bunks are distributed around a large stone courtyard. Throughout the journey, there are sections of original Inca trail – and not all of it has been fully uncovered yet. Our guide, Jesus – or as his friends call him “Chachi”, explained that most people coming to this remote area are scholars and researchers. As we walked, we learned more about the Quechua culture with the stories Jesus was telling us. We learned about each other’s cultures, swapping stories with the kitchen team and horsemen. We all learned words in Quechua and English, and laughed at the similarity of “sheep and this is cheap”. There were big smiles among all when we made it to the top of the high pass on day three – Amawatana at 4,700m – I had never been so high. We made an offering to the Apus – the spirits that are believed to live within the mountains. Just as we became accustomed to the Andean landscape – the mountains and glaciers, the sheep, llamas and alpacas and more, we began to descend to a tropical forest. Here, the river by our side formed several waterfalls between the vertical walls full of red orchids – beautiful. The walk lasted four days, a time to get lost among the beautiful scenery and camp two nights under the incredible starry nights in a beautiful, peaceful and secluded parts of the world. As we walked towards Machu Picchu, our last night was spent in the gorgeous Inca town of Ollantaytambo, where we slept in a cosy hotel. The next morning, we hopped onto a train for a comfortable ride, full of views, to reach the mysterious Inca citadel of Machu Picchu. All the guides were very knowledgeable and friendly. Elar and Olivia were outstanding. Piero was a real character and we enjoyed his company during the Moon Temple Trek. The guide for Sacred Valley was a bit brisk and regimented, probably more accustomed to showing a large group around. The accommodation was good , we like Mamayacchi Guesthouse. We could not find any fault with the organisation. We felt well looked after.